This is the bark of the rainbow eucalyptus (Eucalyptus deglupta), a tree found in the tropical rain forests of the Philippines, New Guinea and Indonesia. It’s a very fragrant tree that grows to an average height of seventy meters. At different times throughout the year the bark sheds in strips, revealing a hidden green trunk. Prolonged exposure causes the trunk to change colour, creating intense vertical streaks of orange, red, purple, blue, green and yellow. 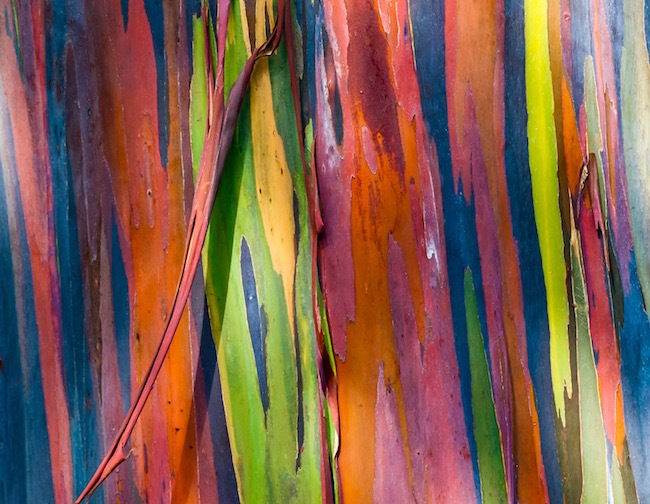 The rainbow eucalyptus, also known as the kaleidoscope tree, produces commercial pulpwood and although the bark may be multicoloured the pulp it produces is the main ingredient for making pure white paper.